There are many different kinds of window blinds, in a variety of materials, but at Luxury Blinds Direct, we specialise in printing high quality photos and designs onto roller blinds. Roller blinds are fantastic at restricting the amount of light entering your home. This is because they are fitted exactly to your window space and can be made from a thicker blackout material. If your window is south-facing, we would recommend our specialised blackout material to ensure almost complete darkness, even when the sun is rising and you need those last few hours of sleep. Roller blinds take up less space than other styles. When roller blinds are unrolled to cover the window, they hang straight down, close to the window. When rolled back up again, they are neatly contained in the fixture at the top of the window. Also, roller blinds leave space on your window sill for ornaments, so you don’t need to compromise on your room decór. Roller blinds are easy to keep clean. Roller blinds are ideal for moisture-heavy rooms like kitchens and bathrooms because they can be made from waterproof materials which limits damage and makes them easy to just sponge clean. Houses with children and pets will also appreciate the easy-clean surface of roller blinds. A soft sponge-clean with a little water should take care of most marks and spillages. Roller blinds are easy to attach and dismantle. This means taking them down for a more thorough clean requires minimum fuss, but it also makes roller blinds ideal for homes that are frequently redecorated. Generally, roller blinds are more affordable than other blinds options, so they are more cost-effective to replace after redecorating, instead of being stuck with bright pink blinds in a room you have just redone in neutral tones. And of course, a major benefit of creating roller blinds with Luxury Blinds Direct, is that you get to completely personalise your creations. Instead of being limited to the number of blinds options in a shop, you can choose from our extensive design library, or better yet, upload a favourite family photo. 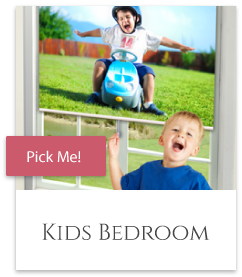 You could have pictures of your children at the beach on blinds in their play room. You could have pictures of your dog gambolling in the garden on blinds in your conservatory. You could have honeymoon snaps on your bedroom blinds. Find out more about our Roller Blinds, including the available fabrics, extras and control placement options on the Our Products page.